Kerosene and propane lights brighten your nights (there's no electricity on Polebridge). The hostel is heated during the winter months by old-fashioned wood stoves. A propane cooking range and refrigerators are on hand to make your food preparation easier after you have spent an exciting day exploring this vast wonderland. Although the area is off the power grid, the hostel has a cordless phone, a fax machine and a computer operated on huge storage batteries. Camcorder and digital camera batteries batteries may be recharged at the hostel. A laptop computer is available for email. Behind the hostel are small living units for family rental. (Some of them have interesting names like the "Goat Chalet.") These cabins are bedrooms with a double bed or a queen bed and a day-couch bed. 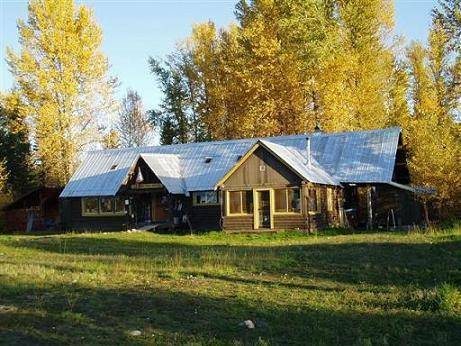 Also, there are two log homes for rent up the road at the Square Peg Ranch. Don't forget to bring linen or sleeping bags, flashlights and food. Clean sheets can be rented at the hostel. The Northern Lights Café, next door to the Mercantile, is open for dinner from Memorial Day week to the end of October and on weekends through most of the rest of the year. It has excellent food at reasonable prices. A real treat for all. The hostel is located on the western edge of Glacier National Park, 1/4 mile (1/2 kilometer) southeast of the Polebridge Mercantile at the end of Beaver Drive (follow the signs). Taking Camas Creek Road through Glacier Park (except when the park is snowed in during the winter) avoids a rough section of the North Fork Road. The North Fork Road north from Columbia Falls to Polebridge is route 486, a gravel road with sections of pavement. In winter when coming from West Glacier, use Blankenship Bridge Road. It is a good idea to have tire chains with you in winter. Try to arrive during daytime to appreciate the views.